Recently, I have been sweater lusting. Hard. All it took was one rainy, typical autumn day to send me into the spiral of craving cashmere, comfort, wool, thick knits, chunky wonderfulness enveloping my upper body. Let me be perfectly clear: I love sweaters. I love them to layer, I love them to dress up or down, I love their versatility – all of the things. All of the time. One trend in particular that seems both classic and in the moment is the Fair Isle Sweater. Fair Isle is the name of a traditional knitting technique used to create patterns with multiple colours; it is named after Fair Isle, a tiny island off the coast of Scotland, grouped among the Shetland Islands. Being Scottish in my heritage, I obviously took to this trend immediately (or…it may have something to do with how charming and lovely it is). 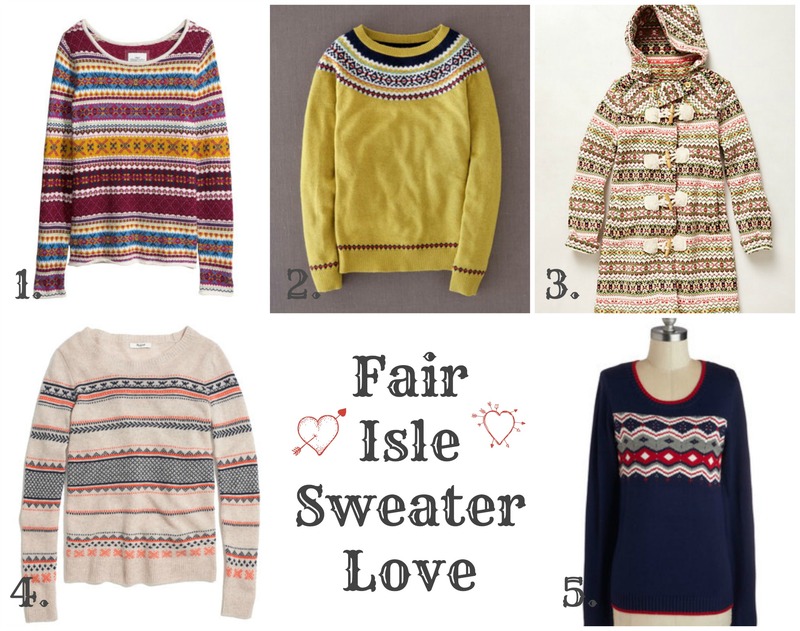 I’ve compiled a variety of ‘Fair Isle’ – inspired sweaters in a range of prices. What’s your favourite? Have you got a Fair Isle sweater? I love Fair Isle sweaters! As a knitter, I keep thinking I should try to make one, but I knit so slowly, sweaters are excruciatingly long projects for me. Oh man… I don’t know if I have the level of patience and skill required for a sweater. I am strictly a scarves and hat kind of girl…although a few years ago I got ambitious and made mittens, although one of them needs to be undone and redone properly (whoops).